Gustave Flaubert, best known for his masterpiece Madame Bovary, spent nearly thirty years working on a surreal and largely ‘unreadable’ retelling of the temptation of Saint Anthony. Colin Dickey explores how it was only in the dark and compelling illustrations of Odilon Redon, made years later, that Flaubert’s strangest work finally came to life. “Anthony: What Is the Point of All This? 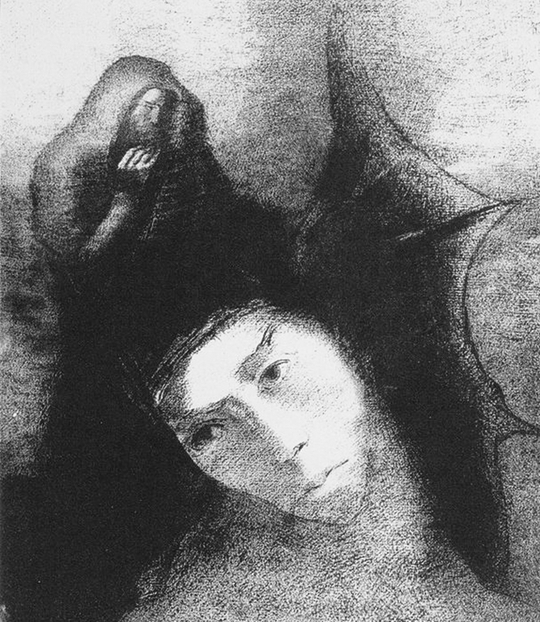 The Devil: There Is No Point!”, by Odilon Redon from his “The Temptation of Saint Anthony” series – Source. Instead of continuing to work on the Temptation, they challenged him instead to write something completely devoid of romanticism and symbolism—something instead minutely detailed, objectively reported, as in the vein of Balzac. 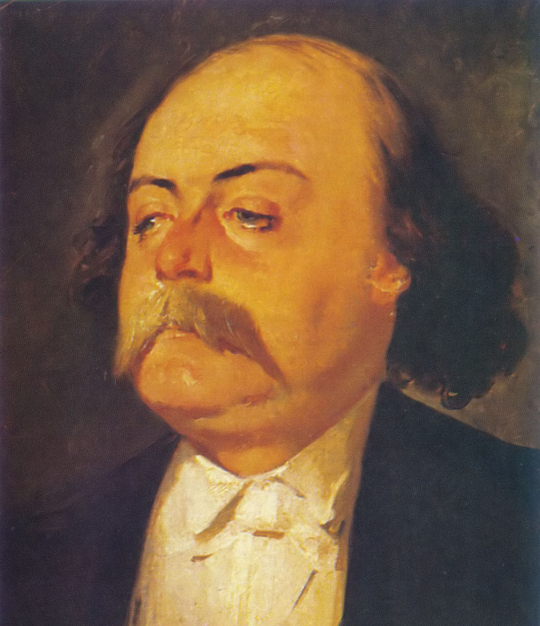 And so Flaubert wrote Madame Bovary, the book that changed not only his life but changed forever contemporary literature—and which, one could say, was the result of something crossed between a dare and a punishment. Detail from a portrait of Flaubert (ca.1856) by Eugène Giraud – Source. The first English translation was by Lafcadio Hearn, begun in 1875, and it remains perhaps the best translation available. As Marshall C. Olds notes in the recent Modern Library edition, Hearn’s rendering—somewhat archaic, anachronistic, and baroque—best matches the strange, baroque quality of the original. The Temptation is one of those few works that does not benefit from a modern translation; the further it recedes into the past, the more compelling the book feels. Then idols of all nations and of all epochs—of wood, of metal, of granite, of feathers, of skins sewn together—pass before them…. The more that the idols commence to resemble the human forms, the more they irritate Anthony. He strikes them with his fists, kicks them, attacks them with fury. They become frightful—with loft plumes, eyes like balls, fingers terminated by claws, the jaws of sharks. But perhaps the real draw of the Temptation is not its readability; its strengths lie elsewhere. Oannes is just one of many creatures in Flaubert’s book that may at first glance to seem to be a product of his imagination, but which was not. An ancient Mesopotamian god who supposedly taught early man writing, art and science, Flaubert learned of him through the writings of the third century BCE Babylonian writer Berossus. As it happens, nearly all of the creatures in the Temptation are figures that Flaubert found in archaic chronicles and encyclopedias: the book is less one of imaginative fancy than it is meticulous research and compilation. What’s remarkable about the Temptation is how it records, with minute accuracy, Flaubert’s research; while it may seem the result of a fevered hallucination, something akin to “Kublai Khan” or the paintings of Bosch, it’s instead a record of copious bibliographic study—and it is this which is perhaps most noteworthy about its composition. “The fantastic is no longer a property of the heart,” Foucault writes, “nor is it found among the incongruities of nature; it evolves from the accuracy of the knowledge, and its treasures lie dormant in documents. Dreams are no longer summoned with closed eyes, but in reading; and a true image is now a product of learning.” The result of prodigious reading, and yet nearly unreadable itself, it would be almost a decade before the Temptation came alive. 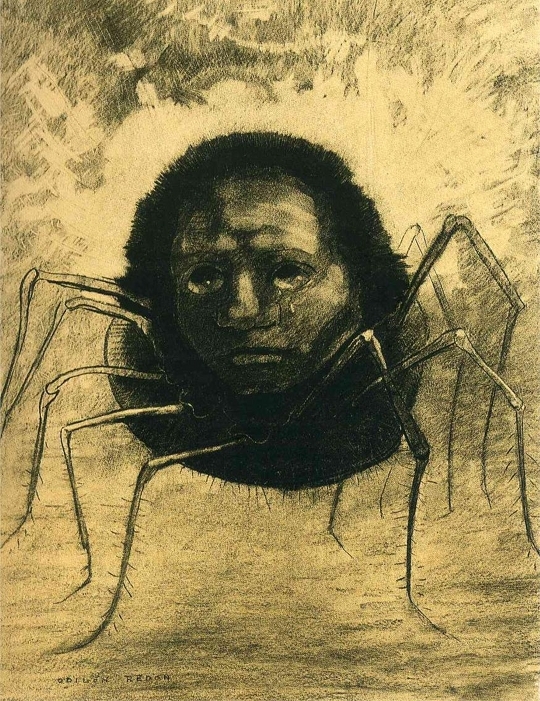 “The Crying Spider” (ca.1881) by Odilon Redon – Source. 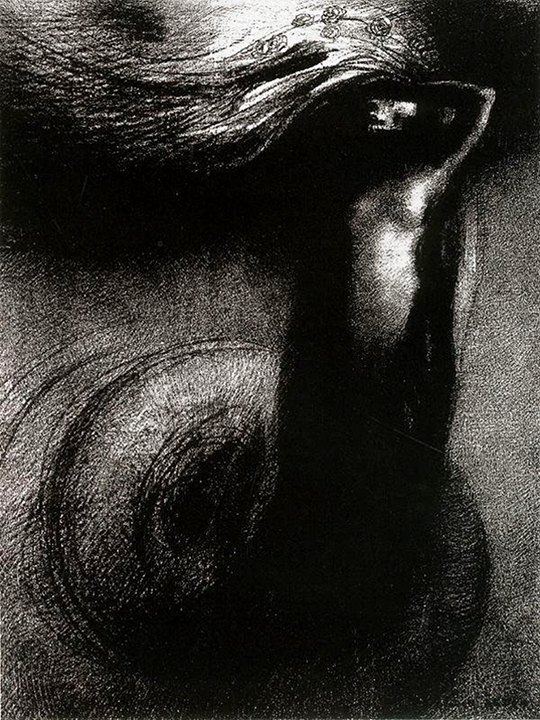 Redon had been working for over a decade when the third and final version of Flaubert’s Temptation was finally published; “It is a literary marvel and a mine for me,” he wrote of the book, in which he saw an endless litany of bizarre figures and distorted creatures that he could adapt as inspiration. 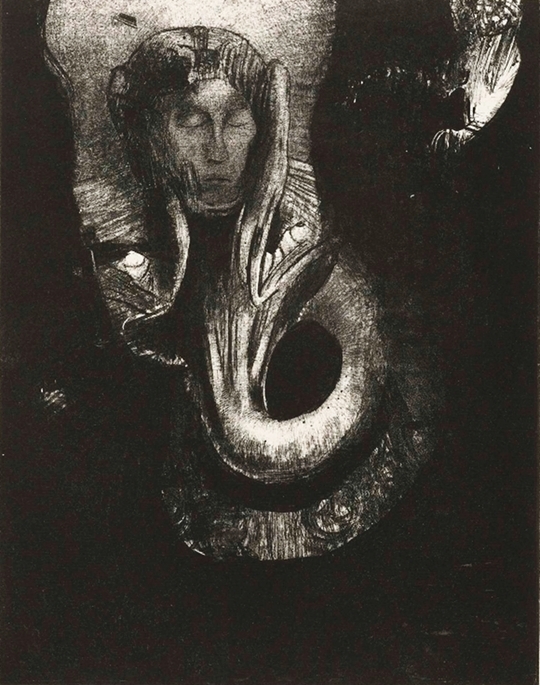 Their work formed a natural kinship; as Stephen F. Eisenman comments, “Like Flaubert, Redon saw himself as unique, an accident, a monster, and all the more remarkable an artist for these very reasons.” Redon began producing a series of plates based on the Temptation, work which finally unlocked the strangeness and decadent symbolism that Flaubert had dreamt of but which he could never quite evoke on the page. 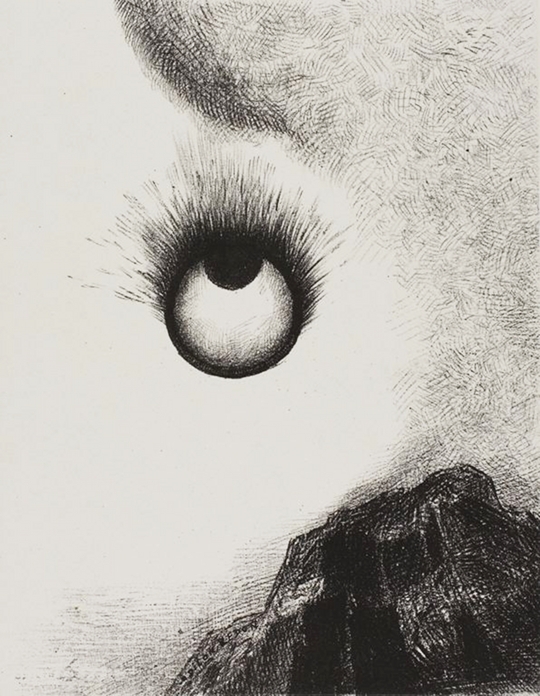 “Everywhere Eyeballs Are Aflame” by Odilon Redon, from his “The Temptation of Saint Anthony” series – Source. 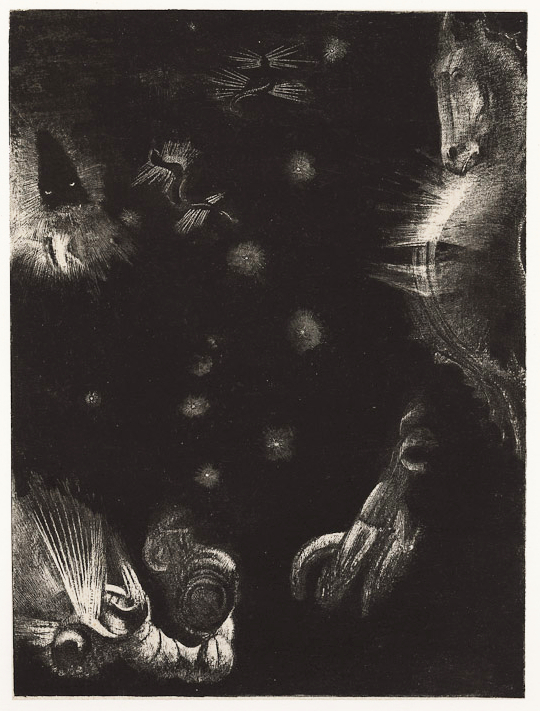 “Death: My Irony Surpasses All Others!” by Odilon Redon, from his “The Temptation of Saint Anthony” series – Source. Other images are far stranger, following Flaubert down the rabbit hole of a world where bodies and shapes are free of any seemingly natural order. Redon’s mastery at using light and shadow, particularly in his use of the pure black that lithography offered, properly evoked the sense of mystery and despair that Flaubert had intended but could never quite create. Redon’s bestiary offers a richer manifestation than Flaubert’s blueprint, particularly his sphinx and chimera, or the half-ostrich, half-ape figure that accompanies Flaubert’s line “There must be, somewhere, primordial figures whose bodies are nothing but their images.” And then there is Oannes, rendered by Redon as a pensive face mounted on a body that swirls up from the darkness. “Oannès: I, the first consciousness of chaos, arose from the abyss that I might harden matter, and give law unto forms” by Odilon Redon, from his “The Temptation of Saint Anthony” series – Source. 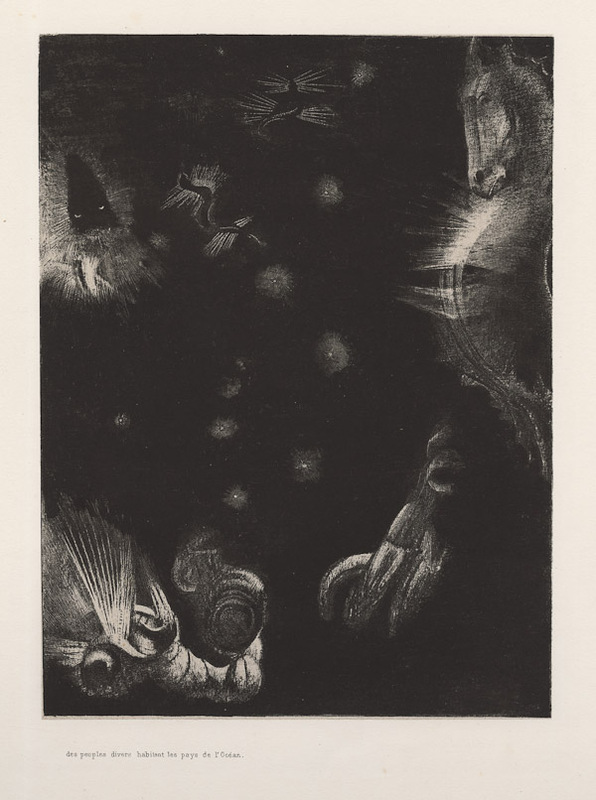 “Then a strange creature appeared with a head of man and a body of a fish”, by Odilon Redon, from his “The Temptation of Saint Anthony” series – Source. “Different Peoples Inhabit the Countries of the Ocean” by Odilon Redon, from his “The Temptation of Saint Anthony” series – Source. Redon’s work, which caused a sensation in its day but has too often been neglected (particularly outside France), represents perhaps the true potential, and use, of Flaubert’s Temptation. An alchemy of Flaubert’s research, his excessive documentation of strange beasts and foreign gods, brought to life by a pictorial imagination that could make use of everything from political satire to naturalists’ field reports, is what finally brings Anthony’s struggle to life, and finally makes clear the horror and awe in his eyes as Redon’s bestiary parades before our eyes. Flaubert’s Temptation is less a book to be read then it is an archive that can be endlessly plundered. As Redon’s work amply demonstrates, there is material left there to mine. Colin Dickey is the author of Cranioklepty: Grave Robbing and the Search for Genius, and Afterlives of the Saints: Stories from the Ends of Faith. He is the co-editor (with Nicole Antebi & Robby Herbst) of ” target=”_blank”>Failure! Experiments in Social and Aesthetic Practices. More information can be found at: www.colindickey.com. The Temptation of St. Anthony (1910) by Gustave Flaubert and translated by Lafcadio Hearn. A selection from Redon’s “The Temptation of Saint Anthony” series at Wikipaintings. An examination into the role that Redon’s interest in science played in the creation of his beautiful and beguiling art, a body of work that was to have such an important influence on the surrealist movement to come in the following decades.